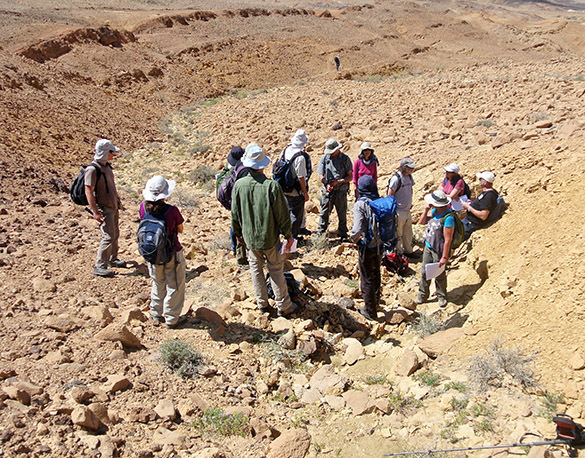 MITZPE RAMON, ISRAEL–We’ve talked a lot about makhteshim in this blog, with so much of our geological work located in Hamakhtesh Hagadol and Makhtesh Ramon. 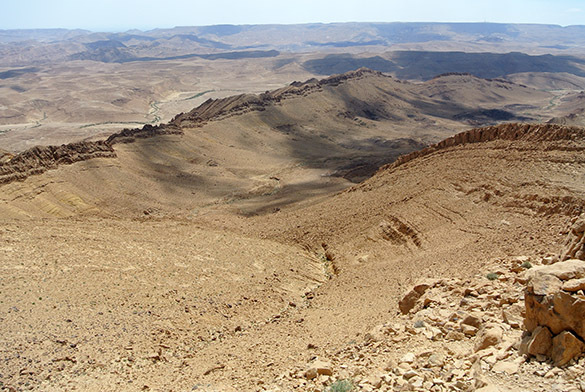 A makhtesh is essentially a breached anticline, usually with a single drainage running from it. There are two small makhteshim at Har ‘Arif that are rarely seen because it takes some effort to get to them (major dirt road challenges and a significant hike) and they are in a military area that has very limited access. The Geological Survey of Israel got permission to run a field trip up to the top of Har ‘Arif today, and I was privileged to go along. The image above is of Har ‘Arif (the peak in the middle) looking up through the axis of the larger of the two makhteshim here. Its elevation is 956 meters, and it is the ninth highest peak in Israel. 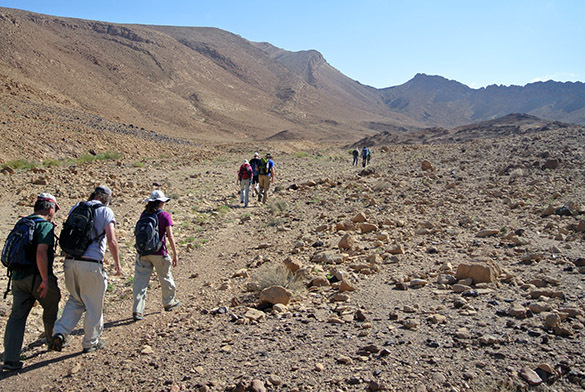 It is noted for its craggy, angular top, which is unlike most other Negev mountains with their rounded or flattened outlines. 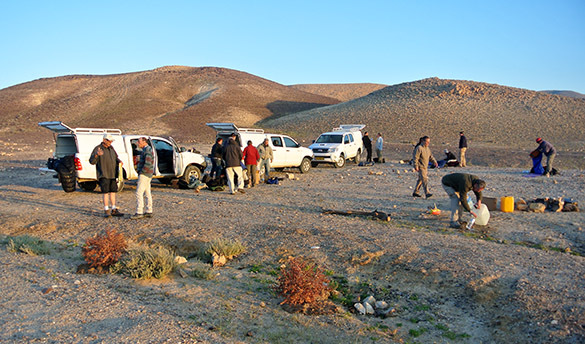 We began the day with an early departure from Mitzpe Ramon to meet most of the team camped out near Har ‘Arif. Note as the sun rises the crew has jackets on. It was an unseasonably cool start. The hike begins. The goal is the very tippy-top of the mountain, so lots of work ahead in this beautiful setting. As with any geology field trip, we stopped occasionally for lectures on the outcrops. These lectures were in Hebrew so I was a spectator. It’s funny that after awhile I could pick out what the major arguments were from the tone of voice and various hand gestures. Several participants (especially Yoav) kindly interpreted for me afterwards. We are here examining an outcrop of the Middle Triassic Raaf Formation. 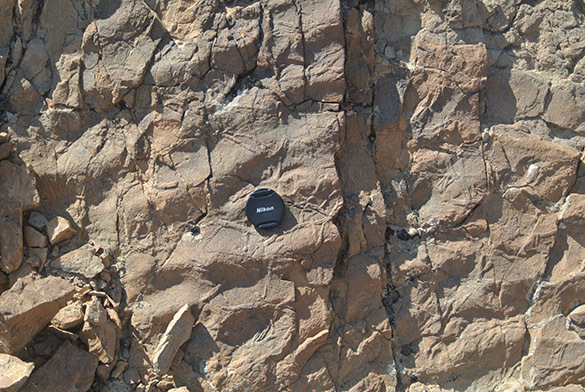 This is a unit low in the Triassic that is not seen elsewhere in Israel. These are ripplemarks in a fine sandstone of the Gevanim Formation (Middle Triassic, Anisian). Note the trace fossils that are convex epirelief, meaning they are positive relief on the surface of the bed. They are of the ichnogenus Gyrochorte, an old friend of mine from the Jurassic of Utah. We reached the top of the mountain after an arduous climb. The coordinates are N 30.42591°, E 34.734°. (Really, google map these numbers. I worked hard for them!) 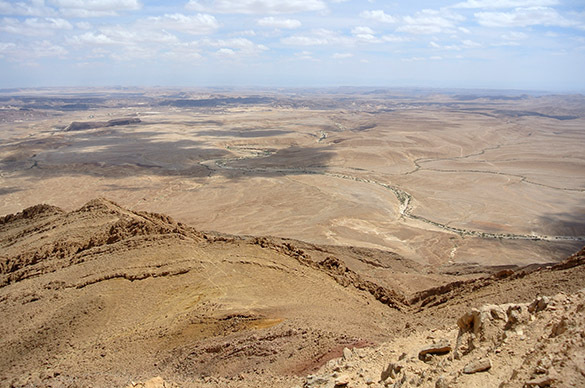 This is the view to the east looking over the Negev all the way to the mountains of Jordan. One limb of the smaller makhtesh is below. Here is the larger of the two makhteshim, looking west from the top of Har ‘Arif. It is gorgeous. All the rocks making the floor and walls are Triassic. The ridge line in the far distance is the border with Egypt. I’ll have more later on the abundant flowers of the Har ‘Arif area. Right now it is a much-anticipated bedtime for me!